For beginners in spoken Chinese. Simple explanations are offered for the involved linguistic phenomena without any further grammatical analysis. Common expression patterns are listed before each text and conversation exercises are provided. The 50 lesson contained in this book are divided into two parts: part one includes 30 lessons consisting of various daily communicative conversations. Part two contains 20 lessons of more complicated expressions. Both parts are well organized and pay attention to the repetition of words and sentence patterns. Separate audio cassettes & videos are available. "Four experienced teachers of beginning Chinese have developed this introductory textbook. A pilot edition has been tested widely in classrooms and refined over a period of years. Among its salient features are lessons that are lively, amusing, and relevant to everyday life: concentrated training of ear and tongue in the sound system of Chinese; extensive grammar notes, clearly presented, with attention to mistakes English-speakers are likely to make; a carefully sequenced character workbook embodying a new and effective approach to the learning of Chinese characters; and audiovisual reinforcement via a complete set of audiotapes and two videotapes, one of which offers entertaining dramatizations of the lesson dialogues. The Chinese Primer is available in two versions, one using the GR system of romanization, which employs different spellings instead of diacritical marks for different tones, the other using Pinyin romanization. The contents of the four volumes are as follows: (1) Blue Book [Lessons]: Introduction; foundation work on pronunciation; lesson dialogues in romanized Chinese and English; appendices; glossary-index. (2) Red Book [Notes and Exercises]: Vocabularies; grammar notes and culture notes keyed to the lessons; exercises. (3) Yellow Book [Character Workbook]: workbook. (4) Green Book [Pinyin Character Text]: Texts of the lessons in both traditional and simplified Chinese characters, and a Chinese introduction for teachers." Four experienced teachers of beginning Chinese have developed this introductory textbook. A pilot edition has been tested widely in classrooms and refined over a period of years. Among its salient features are lessons that are lively, amusing, and relevant to everyday life: concentrated training of ear and tongue in the sound system of Chinese; extensive grammar notes, clearly presented, with attention to mistakes English-speakers are likely to make; a carefully sequenced character workbook embodying a new and effective approach to the learning of Chinese characters; and audiovisual reinforcement via a complete set of audiotapes and two videotapes, one of which offers entertaining dramatizations of the lesson dialogues. The Chinese Primer is available in two versions, one using the GR system of romanization, which employs different spellings instead of diacritical marks for different tones, the other using Pinyin romanization. The contents of the four volumes are as follows: (1) Blue Book [Lessons]: Introduction; foundation work on pronunciation; lesson dialogues in romanized Chinese and English; appendices; glossary-index. (2) Red Book [Notes and Exercises]: Vocabularies; grammar notes and culture notes keyed to the lessons; exercises. (3) Yellow Book [Character Workbook]: workbook. (4) Green Book [Pinyin Character Text]: Texts of the lessons in both traditional and simplified Chinese characters, and a Chinese introduction for teachers. The book stresses the practices of correcting pronunciation as well as the theoretical knowledge related to it. It is divided into five chapters, respectively dealing with speech sounds, international phonetic signs, phonetic symbols, syllabic system of putonghua and phonetic changes and intonations in a speech flow. Not just another audio language program, the On the Move series features an engaging, natural approach to language learning ideally suited for today’s hurry-up world. Unlike other audio programs that feature dreary drill formats and seemingly endless word lists, these innovative programs convey all the vitality and color of the cultures in which the languages are spoken. A lively narrator guides listeners through each course, at times meeting up with two other native speakers who take part in an unfolding story line that encompasses an array of everyday subjects, from meeting people, eating, dining, and shopping to getting around town, telling stories, and family relationships. The Chinese Odyssey, Volume 1 textbook lays the groundwork for solid Chinese language acquisition. Lessons emphasize pronunciation and the use of colloquial expressions, to put students on the right track to speaking Chinese accurately and fluently. Written Chinese is also introduced, but at a slower pace than the spoken language. Volume 1 focuses especially on phonetics to teach students to distinguish tones and sounds, as well as sight reading for pinyin mastery. The volume’s ten lessons contain dialogues and texts, clear and detailed explanations of basic grammar rules and language usage, coordinated grammar and communication exercises, and cultural material. Intended to cover the first semester of Chinese for students in high school or college, Chinese Odyssey, Volume 1 is the first in a series of flexible courseware that can accommodate different learning styles and teaching environments. This textbook is in traditional characters; for simplified characters click here. "Chinese Lessons" is a biographical film about China's leading translator of world poetry. This film traces his remarkable odyssey from a boyhood in exile to imprisonment during the Cultural Revolution to his triumphant winning of the China Book Prize. Chinese Lessons explores his lifelong love affair with great poets of the world, including Emily Dickinson, Wang Wei, Samuel Taylor Coleridge, Federico Garcia Lorca and Edgar Allen Poe. 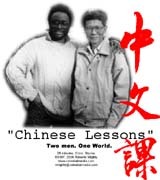 "Chinese Lessons" was produced in cooperation with Zhejiang Province Television, with assistance from Harvard University, the Emily Dickinson Homestead, the Frost Library at Amherst College and the Whittier Birthplace. This book is compiled in accordance with the guidelines and requirements of HSK. It contains all Chinese characters indispensable for basic, elementary and intermediate and advanced Chinese language level tests. It is compiled in the order of strokes, pinyin, related phrases and English translation of each character. For the convenience of the readers, each page of the book is printed in the almost square shape so that each character can be torn off as a card.